Peel eggs the easy way–no more fighting with the egg, having bits of the shell still stuck to it or accidentally peeling away part of the egg along with the shell. 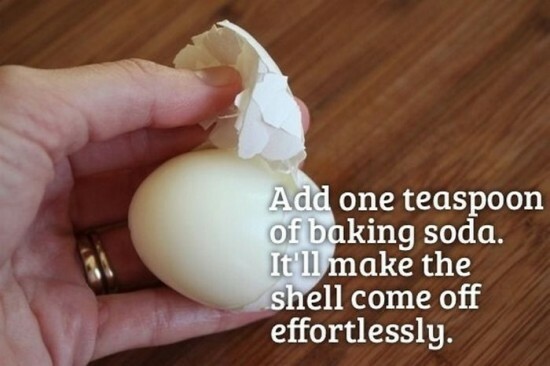 All you have to do is add a teaspoon of baking soda to the water before you boil it. Start with a saucepan half-full of water; add the baking soda; then set the eggs (up to three at a time) in the water. The water should cover the eggs. Bring the water to a boil; once it’s boiling, set the alarm on your phone for nine minutes. When the alarm sounds, remove the pan from heat. Rinse the eggs in cold water and get ready for some delicious egg salad.